The history of project management; a sordid tale of betrayal, lust, and woe, replete with vengeful plots and doomed yet steamy affairs… Okay, maybe not, but it's still kind of cool, if you're into project management, and you're reading a project management blog, so like it or not you're a nerd like the rest of us. Project management technically started with, well, projects. Name a project. There was someone in charge of it. That person was the project manager, and they had a certain way of doing things. So with that out of the way, and assuming you don't want me to go into the project management style of the Egyptians building the pyramids (spoiler alert: if they were around today, HR would frown upon their behavior and also they'd go to jail forever) let's start looking at project management as a discipline when it started truly coming into its own. In the 1950s, people started to recognize the role of the project manager as something separate from that of a general manager, foreman, or department head. As project management tools began to allow for a greater degree of control over a project, the possibilities for a dedicated project manager became apparent. In the early days, there were people like Henry Gantt, who came up with the Gantt chart, and Henri Fayol, who we can thank the five management functions associated with project management. Also during this time, project management evolved from something done on a case-by-case basis, without documented procedures or best practices, into something with a common knowledge base. A method which grew out of that common knowledge base is the Critical Path Method. This method includes making a list of tasks, which must be completed to complete the project, the amount of time each task will take, which tasks depend on each other for completion, and a list of "deliverables" and milestones. Using this method, project managers could prioritize tasks within a given project, and give a more informed timeline for completion. Further, the project manager could identify which tasks have total float versus which are critical. During the following decade, project management continued to evolve, and the need for project managers grew. By the end of the 1960s, the Project Management Institute is formed and publishes A Guide to the Project Management Body of Knowledge. The PMI offered certifications to people who could display a working knowledge of common best practices, stating that the information contained in their guide worked for "most projects, most of the time." With a larger group of people sharing knowledge sets, project management was particularly primed to become what it is today with the technology boom of the 1990s. From the 1990s through today, project management software has evolved from something that would take me days to learn to, in the best cases, an intuitive suite of tools that allow me to do my job more efficiently and effectively than Gantt would have ever imagined possible. I think the most obvious change I've seen during my years of project management is how collaborative it has become. While we used to determine how long things should take with estimates, today I have the people doing the work time themselves using our project management software. No longer am I working with estimates; but, rather, I know to the second how long a task takes. Further, I know how long that task takes individual people, which allows me put them in the right positions for our company. With most aspects of business, I can say from experience that change does not necessarily (or even often) mean evolution. With project management, however, looking at how it started and even what it was as little as 30 years ago, the evolution is clear and undeniable. 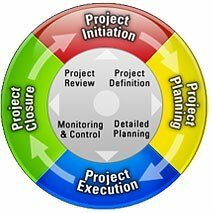 Then Until Now: Project Management Over the Years - InLoox • Copyright 1999-2019 © InLoox, Inc. All rights reserved.